SAN FRANCISCO — Linden Nishinaga recently received a Certificate of Commendation and Appreciation (Kansha-Jo) from Japan’s Ministry of Foreign Affairs, presented by Consul General Jun Yamada at his official residence in San Francisco. 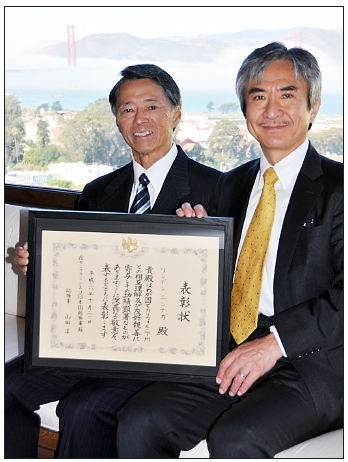 With the Golden Gate Bridge in the background, Linden Nishinaga (left) receives his commendation from Jun Yamada, consul general of Japan in San Francisco. The recognition came as a result of Nishinaga’s many years of service in the building of California/U.S.-Japan relations via advanced, state-of-the-art civil and earthquake engineering technology exchange and project engagement, including but not limited to his work as a member of the California High Speed Rail Project’s Business Advisory Council and the Alfred E. Alquist California Seismic Safety Commission. Nishinaga is an independent professional adviser on civil, structural, earthquake, and sustainability engineering; green design; fresh water, transportation, and energy public policy. He has worked 44 years in the public sector as a California licensed professional civil engineer, structural and earthquake engineer; senior program and project manager; and a LEED (Leadership in Energy and Environmental Design) accredited professional. Since 2012, Nishinaga has been an appointed member of the Torrance Water Commission, and he currently serves as its vice chair. His term expires in 2020. He has also served on the city’s Environmental Quality and Energy Conservation Commission and Cable TV Advisory Board. As a member of the California High Speed Rail Project’s Business Advisory Council, he represents the Asian American Architects/Engineers Association of Southern California and serves as vice chair of the BAC’s Professional Services Committee. In addition to the Seismic Safety Commission, where he chaired the Review Committee on the Pacific Earthquake Engineering (PEER) Center, he has been a member of the U.S. Green Building Council and American Society of Civil Engineers Los Angeles Section Sustainability Committee. A graduate of UCLA, Nishinaga worked as a structural engineer associate for the Los Angeles Department of Water and Power for more than 16 years, a civil engineer/program and project manager for the Port of Los Angeles for nearly 18 years, and a senior civil engineer for the City of Long Beach for more than 10 years.